Some of the links below are affiliate links, meaning, at no cost to you, I may earn a commission if you click through and make a purchase. “No Job is Too Big, No Pup is Too Small!” While we certainly specialize in creating over the top, cohesive party designs and plans together for our personal and corporate clients, we also enjoy helping with budget friendly parties. This Paw Patrol birthday party was pulled together within 1 week and on a tight budget. 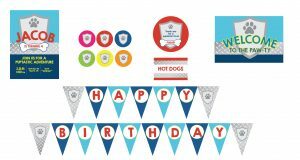 I hope you find inspiration in our Paw Patrol party ideas for your upcoming celebration. Given the venue and 15 minute set-up time, we needed simple, yet cohesive decorations. 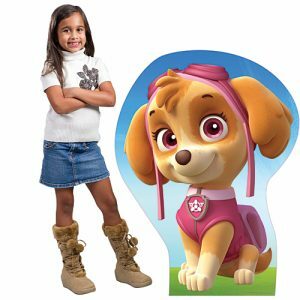 Using 3D glue dots, we attached a printable “Happy Birthday” banner from our general Paw Patrol printables collection to the back wall to serve as a backdrop. To either side of the table, we set bunches of pink and paw print balloons. 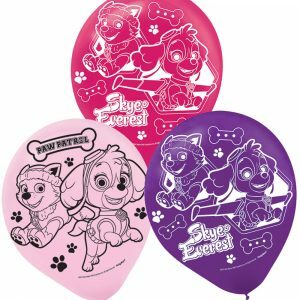 I also love the idea of incorporating pink Paw Patrol character balloons into the bunches. We served a simple grocery store cake personalized with the birthday girl’s cake on Paw Patrol plates. 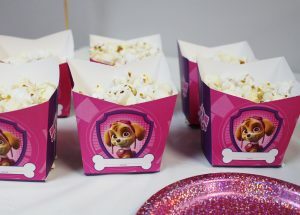 We also offered popcorn served in individual printable Paw Patrol containers we downloaded from the Nick Jr. website. 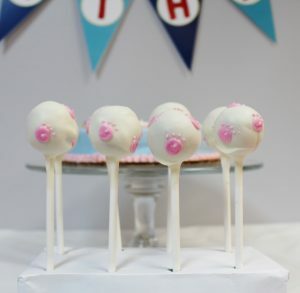 And for fun, we set out a handful of pink paw print cake ball pops. For a venue, generally a snack option or two along with your cake/cupcakes is sufficient for snacks and dessert. Be sure to offer guests beverages, such as individual waters or juice boxes as well. 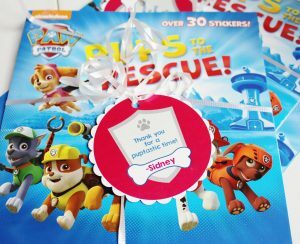 Each party guest took home a paperback Paw Patrol book with a personalized favor tag. I LOVE non-candy or perishable favor items that will last well beyond the celebration. Books are a perfect favor option for younger children. 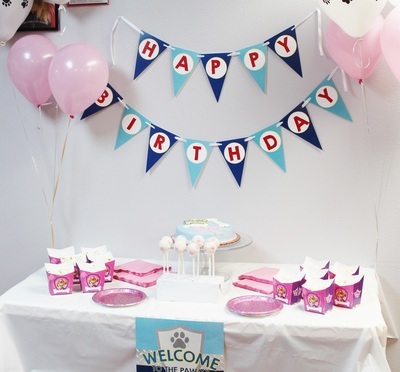 We hope these simple & budget friendly Paw Patrol party ideas inspired your next Paw-ty! 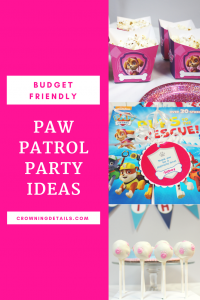 If you are still looking for more Paw Patrol party ideas, be sure to head over to see our Marshall inspired theme. Pretty great post. I simply stumbled upon your weblog and wished to say that I’ve truly enjoyed surfing around your blog posts. 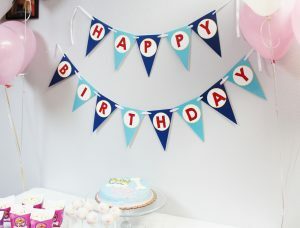 There are several DIY party groups on Facebook and we have a group that you can join to share party ideas! Thank you. We will look into any issues. Details is a little plain. You could glance at Yahoo’s home page and see how they create post headlines to get people to open the links. what you’ve got to say. In my opinion, it could make your website a little livelier. Hello! We actually are on a WordPress platform. We have used Weebly and have heard great things about custom built platforms as well. Hope that helps.